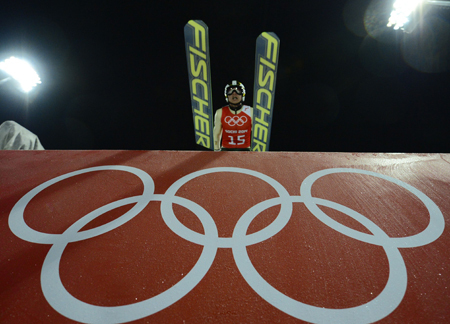 For Korean freestyle skier Seo Jung-hwa, the Winter Olympics nearly ended before they started. The 24-year-old landed awkwardly during a practice run at Sochi’s Rosa Khutor Extreme Park on Friday and appeared to be suffering concussion-like symptoms, just hours before the first qualification rounds in the women’s mogul. 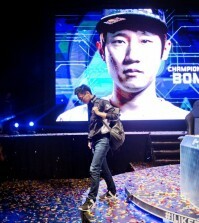 But after undergoing tests at a local hospital, Seo was cleared for Saturday’s qualification round, Korean officials told reporters. 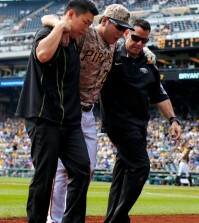 “She suffered a light bruise to her cervical vertebrae. However, the injury isn’t severe and she will be able to compete on Saturday,” said an official from the Korea Ski Federation. Rosa Khutor Extreme Park has been the scene of high-profile injuries in the past few days with athletes complaining about the tough course combined with wet conditions. After falling and jamming his wrist on a slopestyle course, American snowboarder Shaun White announced on Thursday that he was withdrawing from the slopestyle event. White’s injury came a day before Norway’s Torstein Horgmo, a medal-favorite in slopestyle, broke his collarbone while attempting a difficult jump on the same course and was forced out of Olympic competition. Korea’s Seo Jee-won competes during the first qualification round in the women’s mogul at Rosa Khutor Extreme Park. 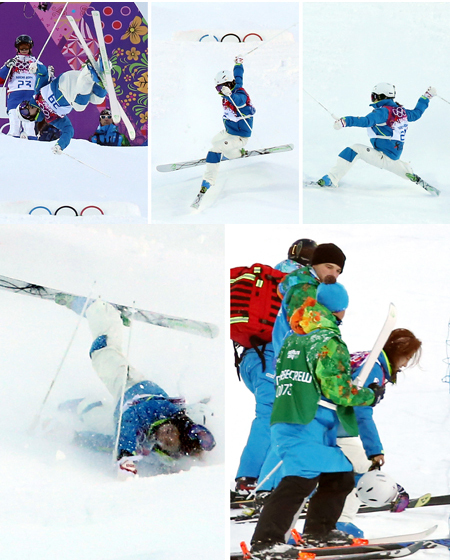 Seo’s coaches didn’t blame her fall on course builders and chalked it up to bad luck. Her 19-year-old cousin and fellow Olympian Seo Jee-won competed in the first round and finished 24th among the 26 skiers who managed to complete their runs. “(Seo Jung-hwa) felt it was hard to compete because of her dizziness… She was with me all the time and I always thought of her as a competitor, but it was devastating for me not being able to be at her side when she was hurt,” a teary Seo Jee-won told Korean reporters after her run. She added that she wasn’t happy about her performance. 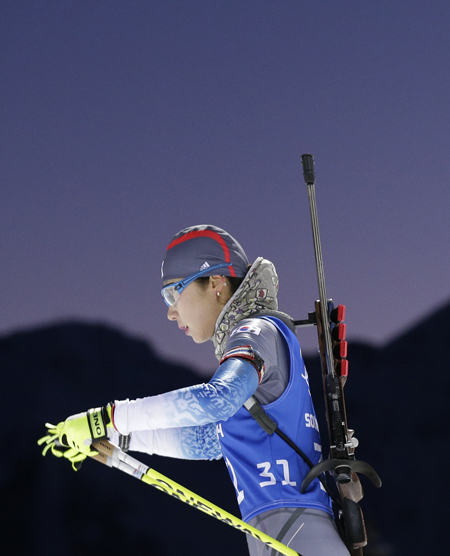 Korea’s Mun Ji-hee skis during a biathlon training session at Krasnaya Polyana. “I think I was composed in the morning, but when the competition began I was shaken a little because I have never skied before in this kind of an atmosphere. There were simply so many people,” said the younger Seo. Coached by Toby Dawson, the Korean-American athlete who won a bronze medal in the men’s mogul ski at the 2006 Olympics, the cousins had aimed to become the first Korean athletes ever to reach the women’s finals. The top 20 athletes in a field of 30 earn a shot at becoming the six “super finalists,” who get to compete for the podium in the finals on Saturday. 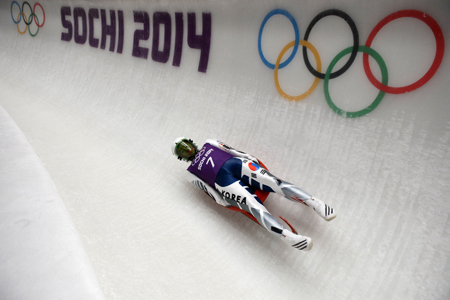 Korea’s Sung Eun-ryung races down the track at the women’s luge training session at the Sanki Sliding Centre. Americans Hannah Kearney, the Vancouver Olympic gold medalist, and Heather McPhie are among the gold-medal favorites in the women’s mogul. 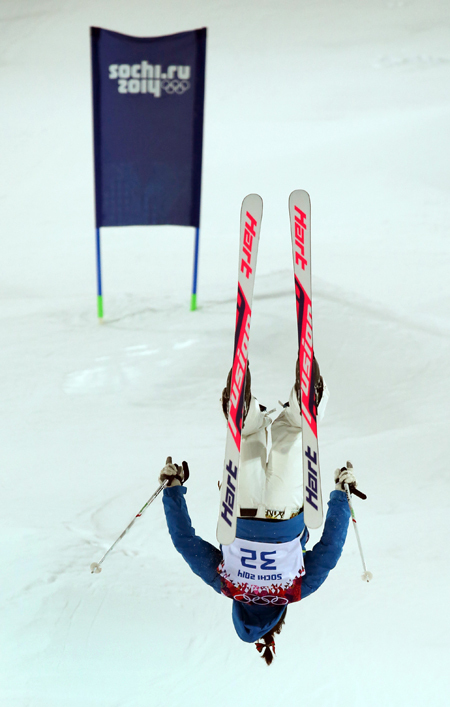 Mogul skiing is one of five Olympic freestyle skiing events. It involves athletes racing on a downhill course over a series of bumps, known as moguls. Skiers are required to perform two jumps during the event, for which they get points; the combination of the quality and difficulty of the jumps, along with speed, determines the winner. Tae Satoya of Japan is the only Olympic medalist from Asia. She won a gold medal at the 1998 Nagano Games and a bronze medal at the 2002 Salt Lake City Games. The sole objective of curling, which could be loosely described as lawn bowling on ice, is to get more stones nearer to the scoring area than your opponent. So it’s understandable that athletes will talk as much about the quality of the ice as tactics and skills. The Korean women’s team has yet to experience Sochi’s Ice Cube curling center as official practice hasn’t yet started, but coach Jeong Yeong-seob admitted he was concerned that the venue was designed by icemakers who prefer trickier surfaces. While curling ice may appear smooth from a distance, the surface is actually “pebbled,” an effect created by spraying water through sprinklers that have different-sized holes. The tops of the frozen droplets are then scraped to provide friction for the stones to travel better. The process is equally an art of precision and creative decision-making. Jung believes that the ice in Sochi has less friction than most venues the Korean athletes have trained or competed on. While this will make it easier to throw the stones at full distance, controlling their location becomes that much more difficult. “Ice technicians such as Hans Wuthrich and Mark Callan who designed the venue in Sochi, tend to make these types of ice, which are very different from the venues we have experienced in Korea or Canada. 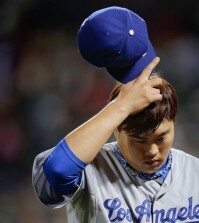 Adjusting to the surface will be critical for us,” Jeong said. Before arriving in Sochi, Jeong had his athletes train at venues in Scotland that were designed by the same ice-making company that hired Wuthrich and Callan. The practice session at the Ice Cube will begin at Saturday evening. The team of Um Min-ji, Shin Mi-sung, Kim Ji-sun, Lee Seul-bee and Gim Un-chi booked the country’s first Olympic ticket in curling last year after winning a silver medal at the 26th Winter Universiade in Trentino, Italy, in December. In the competition at Sochi, 10 teams will play each other once and the top four teams will advance to the semifinals. In the women’s competitions, Sweden and Britain are considered among the gold-medal favorites.